DETROIT - March 30, 2018 - PRLog -- DetailXPerts has been recognized as one of the 2018 Michigan 50 Companies to Watch, an awards program presented by Michigan Celebrates Small Business. This exciting honor is yet another proof of this eco-friendly vehicle detailing company's dedication to making a change in the world one franchise at a time. DetailXPerts is the first eco-friendly auto detailing and car wash company with franchises in the United States. Since the inception of the company's franchising operations in 2008, DetailXPerts has grown and gained international reach, with franchises in countries like the United Arab Emirates (Dubai and Abu Dhabi). DetailXPerts is an entrepreneurial advocate and the company has long-term goals of helping more than 1,100 men and women become independent business owners and creating 30,000 jobs in the next 10 years while actively contributing to the preservation of the environment. Companies making it to the Michigan 50 Companies to Watch list are a remarkable group of second-stage companies, which form the backbone of Michigan's economy. Representing all regions of the state and a diverse range of industries, companies like DetailXPerts are known for their exceptional entrepreneurial leadership, creation of innovation (or use of innovation in creative ways), and their sustainable competitive advantage. "There has never been a better time to join DetailXPerts as a franchise owner and this award verifies it," says Angela Williams, President of DetailXPerts. Winners were selected by Michigan-based judges from the banking, economic development, entrepreneurship development, and venture capital communities. The professionals were positive that DetailXPerts deserves its top position and recognition in the industry due to their outstanding services, unique patent-pending green technology, and affordable business opportunities. DetailXPerts CEO Emmanuel Williams says, "This award is an acknowledgment to the whole team who works relentlessly to achieve our mission and vision. We are a franchise family with distinctive values and dedication that enables us to keep growing stronger together. This accolade goes out to each member of this family, be it an executive level professional, a detail technician, a franchise owner, a headquarters employee, or any other." 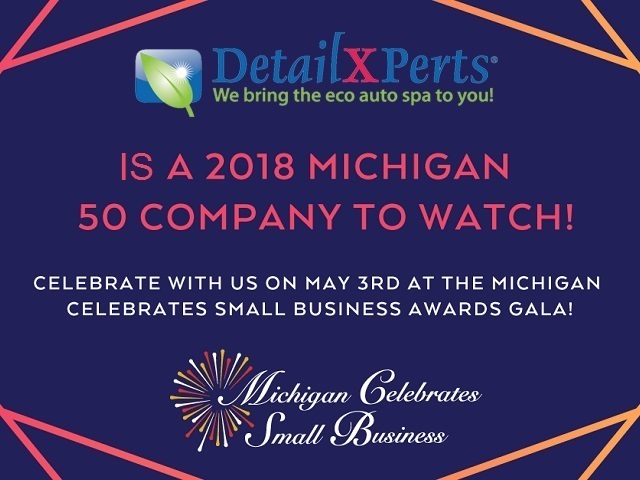 DetailXPerts will be honored at an awards ceremony during the fourteenth annual Michigan Celebrates Small Business gala event on May 3, 2018, in Lansing, MI. For more information on their franchise opportunities, call them at 877-317-9737 or visit their website at www.detailxpertsfranchise.com. What's in a Business Award for DetailXPerts?